This specification defines a discovery protocol to locate services. In an ad hoc mode of operation, probes are sent to a multicast group, and target services that match return a response directly to the requester. To scale to a large number of endpoints and to extend the reach of the protocol, this protocol defines a managed mode of operation and a multicast suppression behavior if a discovery proxy is available on the network. To minimize the need for polling, target services that wish to be discovered send an announcement when they join and leave the network. This document was last revised or approved by the WS-DD TC on the above date. The level of approval is also listed above. Check the “Latest Version” or “Latest Approved Version” location noted above for possible later revisions of this document. Technical Committee members should send comments on this specification to the Technical Committee’s email list. Others should send comments to the Technical Committee by using the “Send A Comment” button on the Technical Committee’s web page at http://www.oasis-open.org/committees/ws-dd/. For information on whether any patents have been disclosed that may be essential to implementing this specification, and any offers of patent licensing terms, please refer to the Intellectual Property Rights section of the Technical Committee web page (http://www.oasis-open.org/committees/ws-dd/ipr.php. The non-normative errata page for this specification is located at http://www.oasis-open.org/committees/ws-dd/. The name "OASIS" is trademarks of OASIS, the owner and developer of this specification, and should be used only to refer to the organization and its official outputs. OASIS welcomes reference to, and implementation and use of, specifications, while reserving the right to enforce its marks against misleading uses. Please see http://www.oasis-open.org/who/trademark.php for above guidance. This specification defines a discovery protocol to locate services. The primary scenario for discovery is a client searching for one or more target services. The protocol defines two modes of operation, an ad hoc mode and a managed mode. In an ad hoc mode, to find a target service by the type of the target service, a scope in which the target service resides, or both, a client sends a probe message to a multicast group; target services that match the probe send a response directly to the client. To locate a target service by name, a client sends a resolution request message to the same multicast group, and again, the target service that matches sends a response directly to the client. To minimize the need for polling in an ad hoc network, when a target service joins the network, it sends an announcement message to the same multicast group. By listening to this multicast group, clients can detect newly available target services without repeated probing. To scale to a large number of endpoints and to extend the reach of the protocol beyond the range of an ad hoc network, this specification defines a managed mode of operation and a multicast suppression behavior if a discovery proxy is available on the network. In managed mode, target services send unicast announcement messages to a discovery proxy and clients send unicast probe and resolve messages to a discovery proxy. To reduce multicast traffic, when a discovery proxy detects a probe or resolution request sent multicast on an ad hoc network, it sends an announcement for itself. By listening for these announcements, clients detect discovery proxies and switch to a managed mode of operation and send unicast probe and resolve messages directly to a discovery proxy. However, if a discovery proxy is unresponsive, clients revert to an ad hoc mode of operation. To support networks with explicit network management services like DHCP, DNS, domain controllers, directories, etc., this specification acknowledges that clients and/or target services can be configured to behave differently than defined herein. For example, another specification may define a well-known DHCP record containing the address of a discovery proxy, and compliance with that specification may require client and target services to operate in a managed mode and send messages to this discovery proxy rather than to a multicast group. While the specific means of such configuration is beyond the scope of this specification, it is expected that any such configuration would allow clients and/or target services to migrate smoothly between carefully-managed and ad hoc networks. The Web service specifications (WS-*) are designed to be composed with each other to provide a rich set of tools to provide security in the Web services environment. This specification specifically relies on other Web service specifications to provide secure, reliable, and/or transacted message delivery and to express Web service and client policy. · Allow discovery of services in ad hoc networks with a minimum of networking services (e.g., no DNS or directory services). · Leverage network services to reduce network traffic and allow discovery of services in managed networks where such network services exist. · Enable smooth transitions between ad hoc and managed networks. · Enable discovery of resource-limited service implementations. · Support bootstrapping to other Web service protocols as well as other transports. · Enable discovery of services by type and within scope. · Leverage other Web service specifications for secure, reliable, transacted message delivery. · Provide extensibility for more sophisticated and/or currently unanticipated scenarios. · Provide liveness information on services. · Define a data model for service description or define rich queries over that description. · The syntax appears as an XML instance, but values in italics indicate data types instead of literal values. · The character "|" is used to indicate a choice between alternatives. · The characters "[" and "]" are used to indicate that contained items are to be treated as a group with respect to cardinality or choice. · Ellipses (i.e., "...") indicate points of extensibility. Additional children and/or attributes MAY be added at the indicated extension points but MUST NOT contradict the semantics of the parent and/or owner, respectively. If a receiver does not recognize an extension, the receiver SHOULD ignore the extension. · XML namespace prefixes (see Table 1) are used to indicate the namespace of the element being defined. Elsewhere in this specification, the characters "[" and "]" are used to call out references and property names. This specification uses the [action] and Fault properties [WS-Addressing] to define faults. Defined below are the basic definitions for the terms used in this specification. An endpoint that makes itself available for discovery. An endpoint that searches for Target Service(s). An endpoint that facilitates discovery of Target Services by Clients. A message sent by a Target Service when it joins a network; this message contains key information for the Target Service. A Hello message is also sent by a Discovery Proxy to reduce multicast traffic on an ad hoc network; this message contains key information about the Discovery Proxy. A best-effort message sent by a Target Service when it leaves a network. A message sent by a Client searching for a Target Service by Type and/or Scope. A message sent by a Client searching for a Target Service by name. An identifier for a set of messages an endpoint sends and/or receives (e.g., a WSDL 1.1 portType, see [WSDL 1.1]). An extensibility point that allows Target Services to be organized into logical groups. Information about the Target Service; includes, but is not limited to, transports and protocols a Target Service understands, Types it implements, and Scopes it is in. An operational mode of discovery in which the Hello, Bye, Probe and Resolve messages are sent multicast. An operational mode of discovery in which the Hello, Bye, Probe and Resolve messages are sent unicast to a Discovery Proxy. A network in which discovery is performed in an ad hoc mode. A network in which discovery is performed in a managed mode. Table 1: Prefix and XML Namespaces used in this specification. Dereferencing the XML namespace defined in Section 1.5 XML Namespaces will produce the Resource Directory Description Language (RDDL) [RDDL] document that describes this namespace, including the XML schema [XML Schema Part 1, 2] and WSDL [WSDL 1.1] declarations associated with this specification. SOAP bindings for the WSDL [WSDL 1.1], referenced in the RDDL [RDDL] document, MUST use “document” for the style attribute. Table 2 lists an example Probe message sent multicast by a Client searching for a printer in an ad hoc mode. Table 2: Example Probe sent multicast in an ad hoc mode. Lines (07-09) in Table 2 indicate the message is a Probe, and Line (13) indicates it is being sent to a well-known address [RFC 2141]. Because there is no explicit ReplyTo SOAP header block [WS-Addressing], any response to this Probe message will be sent as a UDP packet to the source IP address and port of the Probe transport header [SOAP/UDP]. Lines (17-21) specify two constraints on the Probe: Line (17) constrains responses to Target Services that implement a basic print Type; Lines (18-21) constrain responses to Target Services in the Scope for an engineering department. Only Target Services that satisfy both of these constraints will respond. Though both constraints are included in this example of a Probe, they are OPTIONAL. Table 3 lists an example Probe Match message sent in response to the Probe in Table 2. Table 3: Example ProbeMatch sent in response to the ad hoc Probe in Table 2. Lines (07-09) in Table 3 indicate this message is a Probe Match, and Lines (13-15) indicate that it is a response to the Probe in Table 2. Because the Probe did not have an explicit ReplyTo SOAP header block, Lines (16-18) indicate that the response was sent to the source IP address and port of the transport header of the Probe. Line (19) contains an instance identifier as well as a message number; this information allows the receiver to reorder discovery messages received from a Target Service. Lines (23-37) describe a single Target Service. Lines (24-28) contain the stable, unique identifier for the Target Service that is constant across network interfaces, transport addresses, and IPv4/v6. In this case, the value is a UUID based URN [RFC 4122] scheme URI, but it can be a transport URI (like the one in Line 35) if it meets stability and uniqueness requirements. Line (29) lists the Types (see, e.g., [WSDL 1.1]) implemented by the Target Service, in this example, a basic print type that matched the Probe as well as an advanced print type. Lines (30-34) list three administrative Scopes, one that matched the Probe (Line 31), one that is specific to a particular physical location (Line 32), and one that includes data useful when switching over to new infrastructure (Line 33). As in this case, the Scopes can be a heterogeneous collection of deployment-related information. Line (35) indicates the transport addresses where the Target Service can be reached; in this case, a single HTTP transport address. Line (36) contains the version of the metadata for the Target Service; as explained below, this version is incremented if there is a change in the metadata for the Target Service (including Lines 29-34). [RFC 2119] S. Bradner, Key words for use in RFCs to Indicate Requirement Levels, http://www.ietf.org/rfc/rfc2119.txt, IETF RFC 2119, March 1997. [RDDL] Jonathan Borden, et al, Resource Directory Description Language (RDDL) 2.0, http://www.openhealth.org/RDDL/20040118/rddl-20040118.html, 18 January 2004. [RFC 2141] R. Moats, URN Syntax, http://www.ietf.org/rfc/rfc2141.txt, IETF RFC 2141, May 1997. [RFC 3986] T. Berners-Lee, et al, Uniform Resource Identifiers (URI): Generic Syntax, http://www.ietf.org/rfc/rfc3986.txt, IETF RFC 3986, January 2005. [RFC 3987] M. Duerst, et al, Internationalized Resource Identifiers (IRIs), http://www.ietf.org/rfc/rfc3987.txt, IETF RFC 3987, January 2005. [RFC 4516] Smith, M., Ed. and T. Howes, Lightweight Directory Access Protocol (LDAP): Uniform Resource Locator, http://www.ietf.org/rfc/rfc4516.txt, IETF RFC 4516, June 2006. [RFC 4122] P. Leach, et al, A Universally Unique IDentifier (UUID) URN Namespace, http://www.ietf.org/rfc/rfc4122.txt, IETF RFC 4122, July 2005. [Namespaces in XML 1.1] W3C Recommendation, Namespaces in XML 1.1 (Second Edition), http://www.w3.org/TR/2006/REC-xml-names11-20060816/, 16 August 2006. [XML Schema, Part 1] W3C Recommendation, XML Schema Part 1: Structures Second Edition, http://www.w3.org/TR/2004/REC-xmlschema-1-20041028/, 28 October 2004. [XML Schema, Part 2] W3C Recommendation, XML Schema Part 2: Datatypes Second Edition, http://www.w3.org/TR/2004/REC-xmlschema-2-20041028/, 28 October 2004. [XML Sig] W3C Recommendation, XML-Signature Syntax and Processing (Second Edition), http://www.w3.org/TR/2008/REC-xmldsig-core-20080610/, 10 June 2008. [EXC-C14N] W3C Recommendation, Exclusive XML Canonicalization, http://www.w3.org/TR/2002/REC-xml-exc-c14n-20020718/, 18 July 2002. [SOAP 1.1] W3C Note, Simple Object Access Protocol (SOAP) 1.1, http://www.w3.org/TR/2000/NOTE-SOAP-20000508/, 08 May 2000. [SOAP 1.2] W3C Recommendation, SOAP Version 1.2 Part 1: Messaging Framework (Second Edition), http://www.w3.org/TR/2007/REC-soap12-part1-20070427/, 27 April 2007. [SOAP 1.2 Part 2] W3C Recommendation, SOAP Version 1.2 Part 2: Adjuncts (Second Edition), http://www.w3.org/TR/2007/REC-soap12-part2-20070427/, 27 April 2007. [SOAP/UDP] OASIS Committee Specification 01, SOAP-over-UDP Version 1.1, http://docs.oasis-open.org/ws-dd/soapoverudp/1.1/cs-01/wsdd-soapoverudp-1.1-spec-cs-01.docx, May 2009. [WSDL 1.1] W3C Note, Web Services Description Language (WSDL) 1.1, http://www.w3.org/TR/2001/NOTE-wsdl-20010315, 15 March 2001. [WS-Addressing] W3C Recommendation, Web Services Addressing 1.0 - Core, http://www.w3.org/TR/2006/REC-ws-addr-core-20060509, 9 May 2006. [WS-Security] OASIS Standard, Web Services Security: SOAP Message Security 1.1 (WS-Security 2004), http://www.oasis-open.org/committees/download.php/16790/wss-v1.1-spec-os-SOAPMessageSecurity.pdf, February 2006. [WS-Trust] OASIS Standard, WS-Trust 1.4, http://docs.oasis-open.org/ws-sx/ws-trust/v1.4/os/ws-trust-1.4-spec-os.doc, February 2009. [WS-SecureConversation] OASIS Standard, WS-SecureConversation 1.4, http://docs.oasis-open.org/ws-sx/ws-secureconversation/v1.4/os/ws-secureconversation-1.4-spec-os.doc, February 2009. As part of the discovery process, Target Services present to the network (a) a stable identifier and (b) one or more transport addresses at which network messages can be directed. The a:Address element [WS-Addressing] is an absolute IRI [RFC 3987] that need not be a network-resolvable transport address. By convention, it is RECOMMENDED that the value of this element be a stable globally-unique identifier (GUID) based URN [RFC 4122] scheme URI that remains constant across all network interfaces and throughout the lifetime of the Target Service. If the value of this element is not a network-resolvable transport address, such transport address(es) are conveyed in a separate d:XAddrs element defined herein (see below). In an ad hoc mode discovery messages are sent multicast and response messages are sent unicast. Figure 1 depicts the message exchanges between a Target Service and a Client operating in an ad hoc mode. Figure 1 : Message Exchanges in an ad hoc mode. A Target Service sends a multicast Hello message (1) when it joins a network (see Section 4.1.1 Target Service). A Client listens for multicast Hello messages (see Section 4.1.2 Client). A Client sends a multicast Probe message (2) to locate Target Services (see Section 5.2.1 Client). If a Target Service matches the Probe it responds with a unicast Probe Match (PM) message (3) (see Section 5.3.1 Target Service). Other matching Target Services MAY also send unicast Probe Match. A Target Service MAY also accept and respond to unicast Probe messages sent to its transport address(es) (see Section 5.2.2 Target Service). A Client sends a multicast Resolve message (4) to locate a particular Target Service (see Section 6.2.1 Client). If a Target Service matches the Resolve it responds with a unicast Resolve Match (RM) message (5) (see Section 6.3.1 Target Service). A Target Service makes an effort to send a multicast Bye message (6) when it leaves a network (see Section 4.2.1 Target Service). A Client listens for multicast Bye messages (see 4.2.2 Client). Figure 2 depicts the message exchanges in an ad hoc mode when a Discovery Proxy is present on the network. Figure 2: Message exchanges in an ad hoc mode in the presence of a Discovery Proxy. A Target Service sends multicast Hello and Bye (4) and responds to matching multicast Probe and Resolve (5,7). 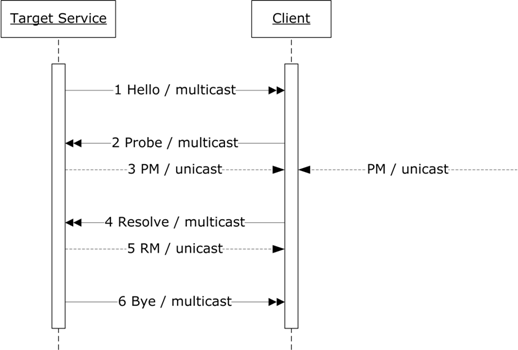 A Client listens for multicast Hello and Bye (4) and sends multicast Probe and Resolve (5). A Discovery Proxy is also a Target Service of a well known d:DiscoveryProxy type and sends a multicast Hello message annoucing its arrival on the network and a multicast Bye message annoucing its departure from the network (1). It responds to the matching Probe and Resolve for itself (2), with a Probe Match (PM) and a Resolve Match (RM) respectively (3). If a Discovery Proxy is configured to reduce multicast traffic on the network, it listens for multicast Hello and Bye from other Target Services (4) and store/update information for corresponding Target Services (see Section 4.1.3 Discovery Proxy and 4.2.3 Discovery Proxy). It responds to the multicast Probe and Resolve for other Target Services (5), with a Hello message (6) (see Section 4.1.3 Discovery Proxy), indicating the Client to switch to managed mode and to send unicast Probe and Resolve (see Section 2.2.2 Managed Mode). In a managed mode discovery messages are sent unicast to a Discovery Proxy. Figure 3 depicts the message exchanges between a Client, a Target Service and a Discovery Proxy in a managed mode. A Target Service sends a unicast Hello message (1) to a Discovery Proxy when it joins a network (see Section 4.1.1 Target Service). A Client sends a unicast Probe request (2) to a Discovery Proxy to locate services (see Section 5.2.1 Client). 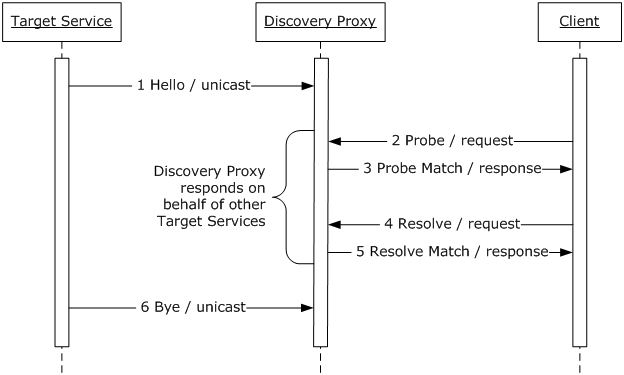 A Discovery Proxy responds to a unicast Probe request with a Probe Match response (3) containing matching Target Services, if any (see Section 5.3.2 Discovery Proxy). A Client sends a unicast Resolve request (4) to a Discovery Proxy to locate a particular Target Service (see Section 6.2.1 Client). A Discovery Proxy respond to a unicast Resolve request with a Resolve Match response (4) containing the matching Target Service, if any (see Section 6.3.2 Discovery Proxy). A Target Service makes an effort to send a unicast Bye message (6) to a Discovery Proxy when it leaves a network (see Section 4.2.1 Target Service). Figure 3: Message exchanges in a managed mode. To operate in a managed mode a Target Service and a Client need an Endpoint Reference of the Discovery Proxy. A Target Service or a Client can acquire this information from a number of ways including, but not limited to explicit configuration, explicit Probe for Discovery Proxy, DNS or DHCP, specifics of which are outside the scope of this specification. One such method that reduces the traffic in an ad hoc network and allows Client to dynamically switch to managed mode is described below. To limit multicast traffic, Clients MAY be configured to dynamically switch from an ad hoc mode to a managed mode and vice versa, depicted in Figure 4. Figure 4: State transitions of a Client configured to dynamically switch operational modes. By default, a Client assumes that no Discovery Proxy (DP) is available because a Discovery Proxy is an optional component and may not be present on the network. The Client operates in an ad hoc mode and listens for multicast Hello and Bye announcements, sends multicast Probe and/or Resolve messages, and listens for Probe Match and/or Resolve Match messages (see Section 2.2.1 Ad hoc Mode). However, if one or more DP that provide multicast suppression are available, those DP send a unicast Hello that contains information about an endpoint that implements a well-known "discovery proxy" type d:DiscoveryProxy in managed mode in response to any multicast Probe or Resolve. 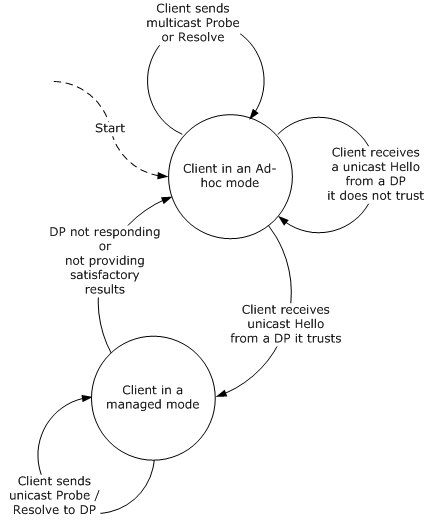 As depicted in Figure 4, Clients listen for this signal that one or more DP are available, and for subsequent searches switch to a managed mode and instead of multicast, send Probe and Resolve messages unicast to one or more DP they trust whilst ignoring multicast Hello and Bye from Target Services. In a managed mode, a Client communicates with a DP as described in Section 2.2.2 Managed Mode; using the transport information contained in the DP Hello; this is typically indicated by the scheme of a transport URI, e.g., "http:" (HTTP), "soap.udp:" (UDP [SOAP/UDP]), or other. If the DP is unresponsive after DP_MAX_TIMEOUT, or if the Client finds the responses from the DP unsatisfactory, the Client reverts to using the multicast messages specified herein. Table 4 specifies the default value for this parameter. Table 4: Default value for Discovery Proxy timeout parameter. This design minimizes discovery latency in ad hoc networks without increasing multicast traffic in managed networks. To see this, note that a Client only generates multicast traffic when it sends a Probe or Resolve; while a Client could Probe (or Resolve) for a DP before Probing (or Resolving) for a Target Service of interest, this is just as expensive in a managed network (in terms of multicast network traffic) as allowing the Client to Probe (or Resolve) for the Target Service directly and having the DP respond to signal its presence; the reduced latency in ad hoc networks arises because the Client does not need to explicitly search and wait for possible DP responses. Some Clients (for example, mobile clients frequently moving within and beyond managed environments) MAY be configured to Probe first for a DP and only if such Probe fails, switch to the operational mode described above. Specific means of such configuration is beyond of the scope of this specification. Unlike a Client, a Target Service operating in an ad hoc mode always sends (multicast) Hello and Bye, and always responds to Probe and Resolve with (unicast) Probe Match and Resolve Match respectively. A Target Service does not need to explicitly recognize and/or track the availability of a DP in an ad hoc mode – a Target Service behaves the same way in an ad hoc mode regardless of the presence or absence of a DP. This is because the Hello and Bye are too infrequent and therefore generate too little multicast traffic to warrant adding complexity to Target Service behavior. However, some Target Services MAY be configured to operate only in a managed mode and unicast Hello and Bye directly to a DP; these would not multicast Hello and Bye or respond to Probe or Resolve; specific means of such configuration are beyond the scope of this specification. Conceptually, Hello, Probe Match, and Resolve Match contain different kinds of information as Figure 5 depicts. Figure 5 : Conceptual content of messages. Starting at the top of Figure 5, Probe maps from Types and/or Scopes to an Endpoint Reference [WS-Addressing] and one or more transport addresses (see Section 2.1 Endpoint References). Though not depicted, Hello provides an Endpoint Reference. Resolve maps the Endpoint Reference to one or more transport addresses (see Section 2.1 Endpoint References). Other address mappings may be needed, e.g., DNS, but are beyond the scope of this specification. The required components of each message are defined in detail below, but as an optimization, a Target Service may short-circuit these message exchanges by including additional components; for instance, a Hello may contain transport address(es) along with an Endpoint Reference, or a transport address may use an IP address instead of a DNS name. Other address bindings MAY be defined but are beyond the scope of this specification. Messages sent over UDP MUST be sent using SOAP over UDP [SOAP/UDP]. To compensate for possible UDP unreliability, senders MUST use the example transmission algorithm in Appendix I of SOAP over UDP. In order to improve interoperability and network efficiency use of SOAP 1.2 protocol [SOAP 1.2] is RECOMMENDED. If the messages described herein are sent unicast using HTTP protocol, they MUST be sent using SOAP HTTP Binding as defined in Section 7 of SOAP 1.2 Part 2 [SOAP 1.2 Part 2]. As designated below, before sending some message types defined herein, a Target Service MUST wait for a timer to elapse before sending the message using the bindings described above. This timer MUST be set to a random value between 0 and APP_MAX_DELAY. Table 5 specifies the default value for this parameter. Table 5: Default value for an application-level transmission parameter. The default value in Table 5 MAY be revised by other specifications. Note: The authors expect this parameter to be adjusted based on interoperability test results. Other transport bindings MAY be defined but are beyond the scope of this specification. Support for messages described in this section MUST be implemented by a Target Service, MUST be implemented by a Discovery Proxy, and MAY be implemented by a Client as described below. Hello is a one-way message sent by a Target Service to announce its availability when it joins the network. It is also sent by a Discovery Proxy to reduce multicast traffic on an ad hoc network. Per SOAP [SOAP 1.1, SOAP 1.2], header blocks MAY appear in any order. MUST be included only by a Discovery Proxy and if and only if Hello is sent unicast in response to a multicast Probe (or Resolve). It MUST be the value of the [message id] property [WS-Addressing] of the multicast Probe (Resolve). In an ad hoc mode, it MUST be “urn:docs-oasis-open-org:ws-dd:ns:discovery:2009:01” [RFC 2141] . In a managed mode, it MUST be the [address] property [WS-Addressing] of the Endpoint Reference of the Discovery Proxy. MUST be included to allow ordering discovery messages from a Target Service (see Section 7 Application Sequencing). SHOULD be omitted in a managed mode. Endpoint Reference for the Target Service (or Discovery Proxy) (see Section 2.1 Endpoint References). Unordered set of Types implemented by the Target Service (or Discovery Proxy). · For a Target Service, if omitted or empty, no implied value. A Target Service MAY omit Types due to security and message size considerations. In a managed mode, all supported Types SHOULD be included. · For a Discovery Proxy, MUST be included and MUST explicitly include d:DiscoveryProxy. Unordered set of Scopes the Target Service (or Discovery Proxy) is in, which MAY be of more than one URI scheme. If included, MUST be a set of absolute URIs, and contained URIs MUST NOT contain whitespaces. If omitted or empty, no implied value. In a managed mode, all Scopes SHOULD be included. Transport address(es) that MAY be used to communicate with the Target Service (or Discovery Proxy). Contained URIs MUST NOT contain whitespaces. If omitted or empty, no implied value. In a managed mode, all transport address(es) SHOULD be included. Incremented by a positive value (>= 1) whenever there is a change in the metadata of the Target Service. If a Target Service goes down and comes back up again, this value MAY be incremented but MUST NOT be decremented (see Section 7 Application Sequencing). Metadata includes, but is not limited to, ../d:Types and ../d:Scopes. By design, this value MAY be used by the Client and/or Discovery Proxy for cache control of Target Service metadata. · It joins a network. This MAY be detected through low-level mechanisms, such as wireless beacons, or through a change in IP connectivity on one or more of its network interfaces, or when it becomes available through one or more additional transport addresses. · Its metadata changes (see /s:Envelope/s:Body/d:Hello/d:MetadataVersion above). To minimize the risk of a network storm and to not overwhelm the recipient (e.g., after a network crash and recovery or power blackout and restoration), a Target Service MUST wait for a timer to elapse before sending the Hello as described in Section 3.1.3 Application Level Transmission Delay. · A Hello MUST be sent multicast to "urn:docs-oasis-open-org:ws-dd:ns:discovery:2009:01" [RFC 2141]. - Cache the union of the previously cached and new metadata. - Replace the previously cached with new metadata. - Use some other means to retrieve more complete metadata. However, to prevent network storms, a Client (or a Discovery Proxy) SHOULD NOT delete cached metadata and SHOULD NOT repeat a Probe (or Resolve) if it detects differences in contained metadata. Table 6 lists an example Hello sent multicast in an ad hoc mode by the same Target Service that responded with a Probe Match in Table 3. Lines (06-08) indicate this is a Hello, and because Line (12) is set to the distinguished URI defined herein, this is a multicast Hello. Line (13) contains an instance identifier as well as a message number; this information allows the receiver to reorder Hello and Bye messages from a Target Service. Lines (17-21) are identical to the corresponding lines in the Probe Match in Table 3. · A Hello MUST be sent unicast to [address] property [WS-Addressing] of the Endpoint Reference of the Discovery Proxy. · A Target Service SHOULD include complete metadata information in the Hello message. Table 7 lists an example Hello sent unicast in a managed mode to a Discovery Proxy. Lines (06-08) indicate this is a Hello, and Line (12) indicates it is sent unicast to Discovery Proxy over HTTP. The AppSequence header is omitted here because the messages sent over HTTP are received in the same order in which they are sent. The Lines (16-28) describe a single Target Service and they are identical to corresponding lines (24-36) in the Probe Match in Table 3. This Hello message sent in a managed mode contains complete information, Lines (16-28), about the Target Service, as opposed to the one sent in the ad hoc mode, Lines (17-22) in Table 6. · To minimize the need to Probe, Clients SHOULD listen for Hello messages and store (or update) information for the corresponding Target Services. 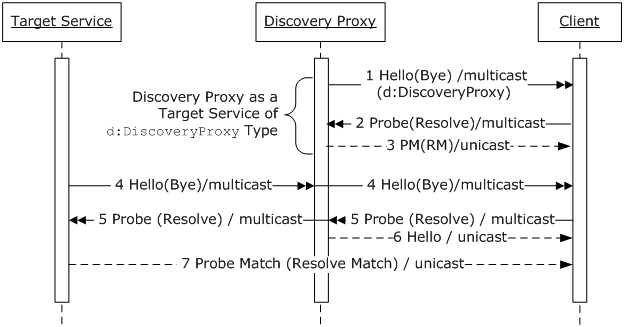 · If a Client receives a Hello message from a Discovery Proxy in response to a multicast Probe (or Resolve) (see Section 4.1.3 Discovery Proxy), the Client SHOULD switch to a managed mode and send unicast Probe (or Resolve) to the Discovery Proxy (see Section 2.2.3 Dynamic Mode Switching). · A Discovery Proxy MUST send a Hello for itself (as a Target Service of d:DiscoveryProxy type) as described in Section 4.1.1 Target Service. · A Discovery Proxy MUST listen for multicast Hello messages and store (or update) information for the corresponding Target Services. · A Discovery Proxy MUST listen for multicast Probe (and Resolve). In response to any multicast Probe (or multicast Resolve) from a Client, a Discovery Proxy MUST send a unicast Hello to the Client and SHOULD send the Hello without waiting for a timer to elapse. · A Discovery Proxy MUST listen for unicast Hello messages and store (or update) information for the corresponding Target Services. Bye is a one-way message sent by a Target Service when it is preparing to leave the network. As constrained for Hello (see Section 4.1 Hello). Endpoint Reference for the Target Service (see Section 2.1 Endpoint References). Transport address(es) on which the Target Service (or Discovery Proxy) is no longer available. Contained URIs MUST NOT contain whitespaces. If omitted or empty, no implied value. As constrained for Hello (see Section 4.1 Hello). If omitted, no implied value. A Target Service MAY send the Bye without waiting for a timer to elapse. · A Bye MUST be sent multicast to "urn:docs-oasis-open-org:ws-dd:ns:discovery:2009:01" [RFC 2141]. Table 8 lists an example Bye message sent multicast in an ad hoc mode corresponding to the Hello in Table 6. Table 8 Example Bye message sent multicast in an ad hoc mode. Lines (06-08) indicate this is a Bye, and like the Hello in Table 6, the distinguished URI in Line (12) indicates it is a multicast Bye. The sequence information in Line (13) indicates this message is to be ordered after the Hello in Table 6 because the Bye has a larger message number than the Hello within the same instance identifier. Note that the Body (Lines 16-22) is an abbreviated form of the corresponding information in the Hello; when a Target Service leaves a network, it is sufficient to send the stable identifier to indicate the Target Service is no longer available. · A Bye MUST be sent unicast to [address] property [WS-Addressing] of the Endpoint Reference of the Discovery Proxy. Table 9 lists an example Bye message corresponding to the Hello message in Table 7, sent unicast in a managed mode to a Discovery Proxy. Table 9: Example Bye message sent unicast in a managed mode to a Discovery Proxy. Lines (06-08) indicate this is a Bye, and like Hello in Table 7, Line (12) indicates that it is sent unicast to a Discovery Proxy over HTTP. Like Hello in Table 7, the application sequencing information is omitted because the messages sent unicast over HTTP are received in the same order in which they are sent. Like Bye in Table 10 the Body (Lines 15-21) is an abbreviated form of the corresponding information in the Hello. In an ad hoc mode, Clients SHOULD listen for Bye messages, marking or removing corresponding information as invalid. Clients MAY wish to retain information associated with a Target Service that has left the network, for instance if the Client expects the Target Service to rejoin the network at some point in the future. Conversely, Clients MAY discard information associated with a Target Service at any time, based on, for instance, preset maximums on the amount of memory allocated for this use, lack of communication to the Target Service, preferences for other Target Service Types or Scopes, and/or other application-specific preferences. · A Discovery Proxy SHOULD send a Bye for itself (as a Target Service of d:DiscoveryProxy type) when it is preparing to leave the network as described in Section 4.2.1 Target Service. · A Discovery Proxy MUST listen for multicast Bye messages, marking or removing corresponding information as invalid. · A Discovery Proxy MUST listen for unicast Bye messages, marking or removing corresponding information as invalid. Note that both in an ad hoc mode and a managed mode, a Discovery Proxy MAY retain information associated with a Target Service that has left the network, for instance if the Discovery Proxy expects the Target Service to rejoin the network at some point in the future. Conversely, Discovery Proxy MAY discard information associated with a Target Service at any time, based on, for instance, preset maximums on the amount of memory allocated for this use, lack of communication to the Target Service, preferences for other Target Service Types or Scopes, and/or other application-specific preferences. To find Target Services by the Type of the Target Service, a Scope in which the Target Service resides, both, or simply all Target Services, a Client sends a Probe. A Probe includes zero, one, or two constraints on matching Target Services: a set of Types and/or a set of Scopes. A Probe Match MUST include a Target Service if and only if all of the Types and all of the Scopes in the Probe match the Target Service. · The namespace [Namespaces in XML 1.1] of T1 and T2 are the same. · The local name of T1 and T2 are the same. A Scope S1 in a Probe matches Scope S2 of a Target Service per the rule indicated within the Probe. This specification defines the following matching rules. Other matching rules MAY be used, but if a matching rule is not recognized by a receiver of the Probe, S1 does not match S2 regardless of the value of S1 and/or S2. · Neither S1 nor S2 contain the "." segment or the ".." segment. All other components (e.g., query and fragment) are explicitly excluded from comparison. S1 and S2 MUST be canonicalized (e.g., unescaping escaped characters) and trailing slashes (‘/’) MUST be removed before using this matching rule. Note: this matching rule does NOT test whether the string representation of S1 is a prefix of the string representation of S2. For example, "http://example.com/abc" matches "http://example.com/abc/def" using this rule but "http://example.com/a" does not. S1 and S2 are universally-unique identifier (UUID) based URN [RFC 4122] scheme URIs and each of the unsigned integer fields [RFC 4122] in S1 is equal to the corresponding field in S2, or equivalently, the 128 bits of the in-memory representation of S1 and S2 are the same 128 bit unsigned integer. Using a case-insensitive comparison, the scheme of S1 and S2 is "ldap" and the host and the port [RFC 3986] of S1 and S2 are the same and the RDNSequence [RFC 4514] of the dn [RFC 4516] of S1 is a prefix of the RDNSequence [RFC 4514] of the dn [RFC 4516] of S2. Using a case-sensitive comparison, the string representation of S1 and S2 is the same. With this rule the Probe matches the Target Service if and only if the Target Service does not have any Scopes. When a Probe specifies this rule it MUST NOT contain any Scopes. If included, MUST be of type a:EndpointReferenceType [WS-Addressing]. If omitted, implied value of the [reply endpoint] property [WS-Addressing] is "http://www.w3.org/2005/08/addressing/anonymous". If the value is "http://www.w3.org/2005/08/addressing/anonymous", [reply endpoint] property is defined by the underlying transport. For example, if the Probe was received over UDP using the assignments listed in Section 3.1.1 Ad hoc mode over IP multicast, the [reply endpoint] is the IP source address and port number of the Probe transport header [SOAP/UDP]. · If sent to a Target Service, MUST be "urn:docs-oasis-open-org:ws-dd:ns:discovery:2009:01" [RFC 2141]. · If sent to a Discovery Proxy, MUST be the [address] property of the Endpoint Reference for the Discovery Proxy, e.g., as contained in a Hello from the Discovery Proxy. If omitted or empty, implied value is any Type. If included, MUST be a list of absolute URIs, and contained URIs MUST NOT contain whitespaces. The contained URIs MAY be of more than one URI scheme. If omitted or empty, implied value is any Scope. The value MUST be compared per RFC 3986 Section 6.2.1 Simple String Comparison [RFC 3986]. E.g., the matching rule specified is not supported. To Probe for all Target Services, a Client MAY omit both /s:Envelope/s:Body/d:Probe/d:Types and ./d:Scopes. A Client MAY send a Probe to find Target Services of a given Type and/or in a given Scope or to find Target Services regardless of their Types or Scopes. · A Probe is a one-way message. · A Probe MUST be sent multicast to "urn:docs-oasis-open-org:ws-dd:ns:discovery:2009:01" [RFC 2141] . · Wait for a sufficient number of Probe Match messages. · Repeat the Probe several times until the Client is convinced that no further Probe Match messages will be received. The Client MUST use the same value for the [message id] property [WS-Addressing] in all copies of the Probe. If a Client knows a transport address of a Target Service, the Probe MAY be sent unicast to that address. · A Probe is a request message. · A Probe MUST be sent unicast to [address] property [WS-Addressing] of the Endpoint Reference of the Discovery Proxy. Table 10 lists an example Probe message sent unicast to a Discovery Proxy by a Client searching for a printer in a managed mode. Table 10: Example Probe sent unicast to a Discovery Proxy in a managed mode. Lines (07-09) in Table 10 indicate this message is a Probe, and Line (13) indicates it is being sent to a Discovery Proxy over HTTP. Lines (17-21) specify two constants on the Target Services and they are identical to the corresponding Lines (17-21) in Table 2. · A Target Service MUST listen for multicast Probe messages and respond as described in Section 5.3.1 Target Service. · A Target Service MAY listen for unicast Probe requests at its transport address(es) (see Section 2.1 Endpoint References) and respond to them as described in Section 5.3.1 Target Service. · A Discovery Proxy MUST listen for multicast Probe messages for itself and respond as described in Section 5.3.2 Discovery Proxy. · A Discovery Proxy MAY be configured to reduce multicast traffic on an ad hoc network, in this capacity, a Discovery Proxy MUST listen for multicast Probe for other Target Services and respond to them with a Hello message as described in Section 4.1.3 Discovery Proxy. · A Discovery Proxy MUST listen for unicast Probe request and respond to them as described in Section 5.3.2 Discovery Proxy. Probe Match is sent by a Target Service or a Discovery Proxy in response to a Probe. MUST be the value of the [message id] property [WS-Addressing] of the Probe. If the [reply endpoint] property [WS-Addressing] of the corresponding Probe is the IP source address and port number of the Probe transport header (e.g., when the a:ReplyTo header block was omitted from the corresponding Probe), the value of this header block MUST be "http://www.w3.org/2005/08/addressing/anonymous". See /s:Envelope/s:Body/d:Hello/d:Types in Section 4.1 Hello. See /s:Envelope/s:Body/d:Hello/d:Scopes in Section 4.1 Hello. Transport address(es) that MAY be used to communicate with the Target Service (or Discovery Proxy). Contained URIs MUST NOT contain whitespaces. If a Target Service (or Discovery Proxy) has transport addresses (see Section 2.1 Endpoint References) at least one transport address MUST be included. If omitted or empty, no implied value. See /s:Envelope/s:Body/d:Hello/d:MetadataVersion in Section 4.1 Hello. · If a Target Service receives a Probe that match, it MUST respond with a Probe Match message. If the Target Service receives more than one copy of the Probe as determined by the [message id] property [WS-Addressing], it SHOULD respond only once. A Target Service MUST wait for a timer to elapse after receiving a Probe and before sending a Probe Match as described in Section 3.1.3 Application Level Transmission Delay. 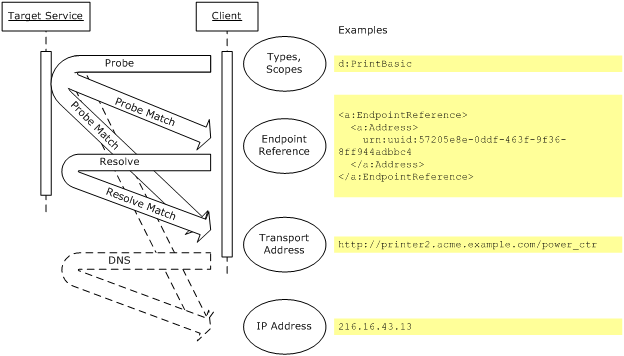 The Probe Match MUST be unicast to the [reply endpoint] property [WS-Addressing] of the Probe. · If a Target Service receives a Probe and does not match the Probe, it MUST NOT respond with a Probe Match. Table 3 lists an example Probe Match message sent in response to the multicast Probe listed in Table 2. · If a Discovery Proxy receives a Probe for itself as determined by the presence of d:DiscoveryProxy in the Types, it MUST respond with a Probe Match message and MUST wait for a timer to elapse (see Section 3.1.3 Application Level Transmission Delay). The Probe Match MUST be unicast to the [reply endpoint] property [WS-Addressing] of the Probe. · A Discovery Proxy MAY be configured to reduce multicast traffic on an ad hoc network, in this capacity, if a Discovery Proxy receives a Probe for other Target Services it MUST respond with a Hello (see Section 4.1.3 Discovery Proxy). · If a Discovery Proxy receives a Probe request it MUST respond with a Probe Match message without waiting for a timer to elapse. The Probe Match SHOULD include complete metadata information about the matching Target Services. However, the Probe Match MAY contain zero matches if the Discovery Proxy has no matching Target Services. Table 11 lists an example Probe Match message sent by the Discovery Proxy in response to the Probe message in Table 10. Lines (07-09) in Table 11 indicate this message is a Probe Match; and Lines (13-15) indicate that it is a response to the Probe message in Table 10. Since this Probe Match message was sent over HTTP in response to the Probe message and since messages sent over HTTP are received in the order they are sent, it does not contain a header that identifies the instance number and message number like Line (19) in Table 3. Lines (20-32) describe a Target Service and they are identical to the corresponding lines (24-36) in Table 3. Lines (35-47) describe another Target Service, a basic printer service; that match the Probe in Table 10. To locate a Target Service, i.e., to retrieve its transport address(es), a Client sends a Resolve. Support for messages described in this section MUST be implemented by a Target Service, MUST be implemented by a Discovery Proxy and MAY be implemented by a Client as described below. A Resolve includes a constraint on matching Target Service: an Endpoint Reference [WS-Addressing]. A Resolve Match MUST include a Target Service if and only if the Endpoint Reference in the Resolve match the Target Service. An Endpoint Reference E1 in a Resolve matches Endpoint Reference E2 of a Target Service if the [address] property [WS-Addressing] of E1 matches the [address] property [WS-Addressing] of E2 per Section 6 of RFC 3986 [RFC 3986]. As constrained for Probe (see Section 5.2 Probe). A Client MAY send a Resolve to retrieve network transport information for a Target Service if it has an Endpoint Reference [WS-Addressing] for the Target Service. · A Resolve is a one-way message. · A Resolve MUST be sent multicast to "urn:docs-oasis-open-org:ws-dd:ns:discovery:2009:01" [RFC 2141] . · A Resolve MUST be sent unicast to [address] property [WS-Addressing] of the Endpoint Reference of the Discovery Proxy. · A Target Service MUST listen for multicast Resolve messages and respond to them as described in Section 6.3.1 Target Service. · A Discovery Proxy MUST listen for multicast Resolve messages for itself and respond to them as described in Section 6.3.2 Discovery Proxy. · A Discovery Proxy MAY be configured to reduce multicast traffic on an ad hoc network, in this capacity, a Discovery Proxy MUST listen for multicast Resolve for other Target Services and respond to them with a Hello message as described in Section 4.1.3 Discovery Proxy. · A Discovery Proxy MUST listen for unicast Resolve requests and respond to them as described in Section 6.3.2 Discovery Proxy. Resolve Match is sent by a Target Service or a Discovery Proxy in response to a Resolve. MUST be the value of the [message id] property [WS-Addressing] of the Resolve. As constrained for Probe Match (see Section 5.3 Probe Match). · If a Target Service receives a Resolve that matches it MUST respond with a Resolve Match message. If the Target Service receives more than one copy of the Resolve as determined by the [message id] property [WS-Addressing], it SHOULD respond only once. The Resolve Match MUST be unicast to the [reply endpoint] property [WS-Addressing] of the Resolve without waiting for a timer to elapse. · If a Target Service receives a Resolve that does not match, it MUST NOT respond with a Resolve Match. · If a Discovery Proxy receives a Resolve for itself, it MUST respond with a Resolve Match message. If the Discovery Proxy receives more than one copy of the Resolve as determined by the [message id] property [WS-Addressing], it SHOULD respond only once. The Resolve Match MUST be unicast to the [reply endpoint] property [WS-Addressing] of the Resolve without waiting for a timer to elapse. · A Discovery Proxy MAY be configured to reduce multicast traffic on an ad hoc network, in this capacity, if a Discovery Proxy receives a Resolve for other Target Services, it SHOULD respond with a Hello (see Section 4.1.3 Discovery Proxy). · If a Discovery Proxy receives a Resolve request and it has a Target Service that matches the Resolve, it MUST respond with a Resolve Match message. The Resolve Match SHOULD include complete metadata information about the matching Target Service. However, the Resolve Match MAY contain zero matches if the Discovery Proxy has no matching Target Service. The Application Sequencing header block allows a receiver to order messages that contain this header block though they might have been received out of order. It is used by this specification to allow ordering messages from a Target Service; it is also expected that this header block will be useful in other applications. Identifies a sequence within the context of an instance identifier. If omitted, implied value is null. MUST be unique within ./@InstanceId. MUST be compared per RFC 3986 Section 6.2.1 Simple String Comparison [RFC 3986]. The ordering of messages with different value of SequenceId but the same value of InstanceId within the Application Sequencing Header block is undefined. Identifies a message within the context of a sequence identifier and an instance identifier. MUST be incremented by a positive value (>= 1) for each message sent. Transport-level retransmission MUST preserve this value. This specification does not require that endpoints participating in the discovery process be secure. However, this specification RECOMMENDS that security be used to mitigate various types of attacks (see Section 8.3 Security Considerations). If a Target Service wishes to secure Hello, Bye, Probe Match and/or Resolve Match, it SHOULD use the compact signature format defined in Section 8.2 Compact Signature Format. A Client MAY choose to ignore Hello, Bye, Probe Match, and/or Resolve Match if it cannot verify the signature. If a Client wishes to secure Probe and Resolve, it SHOULD use the compact signature format defined in Section 8.2 Compact Signature Format. A Target Service MAY chose to ignore received Probe and/or Resolve if it cannot verify the signature. · The Target Service fails to verify the signature contained in the Probe (or Resolve). To avoid participating in a Distributed Denial of Service attack, a Target Service or Discovery Proxy SHOULD NOT respond to a message without a valid signature and MUST NOT respond to a message without a valid signature if the [reply endpoint] is not "http://www.w3.org/2005/08/addressing/anonymous". · The Client fails to verify the signature contained in the Probe Match (or Resolve Match). Table 12 specifies the default value for the MATCH_TIMEOUT parameter. Table 12: Default value for an application-level parameter. If a Target Service has multiple credentials, it SHOULD send separate Hello, Bye, Probe Match, and/or Resolve Match using different credentials to sign each. The same security requirements as defined for a Target Service apply to a Discovery Proxy. This section defines the compact signature format for signing UDP unicast and multicast messages. A sender creates the compact signature from a full XML Signature [XML Sig] for optimized transmission. A receiver expands the compact signature to a full XML Signature [XML Sig] for verification. An alternate ID reference mechanism with the same meaning as @wsu:Id [WS-Security].This attribute MAY be used to identify which message parts are signed by the compact signature. A sub-class of the wsse:Security header block [WS-Security] that has the same processing model and rules but is restricted in terms of content and usage. The d:Sig child element provides a compact message signature. Its format is a compact form of XML Signature. To process the signature, the compact form is parsed, and an XML Signature ds:SignedInfo block is created and used for signature verification. Processing of the d:Security header block is not mandatory; therefore, the d:Security header block SHOULD NOT be marked mustUnderstand with a value of "true". The governing scheme of the signature. Provides exactly one algorithm for digests and signatures. The key identifier of the signing token in Base64-encoded form. MUST be specified if a public key token is used. If included, MUST be the Thumbprint (SHA-1 hash of the raw octets) of the signing token. If omitted, the semantics are undefined. Parts of the message that have been canonicalized and digested. Each part is referenced by @d:Id (see above). Only the immediate children of the security header, top-level SOAP header blocks (/s:Envelope/s:Header/*) other than the security header (/s:Envelope/d:Security), and the full SOAP Body (/s:Envelope/s:Body) can be referenced in this list. The value is a space-separated list of IDs to elements within the message. If present, MUST NOT be empty and MUST be the value of InclusiveNamespaces PrefixList parameter [EXC-C14N] passed to the exclusive canonicalization method. If omitted, no implied value. The IncludeNamespaces PrefixList MUST include the prefixes that declare the XML namespace for the Types (/s:Envelope/s:Body/*/d:Types) and MAY include other content of the type xs:QName in the message, as the exclusive canonicalization method excludes (see Exclusive XML Canonicalization Section 1.3 [EXC-C14N]) the namespaces that are not visibly utilized. The Base64-encoded value of the signature. Table 13 lists an example compact signature. Table 13: Example compact signature. A compact signature is expanded into an XML Signature ds:SignedInfo using the following pseudo-code. The SignedInfo block within the expanded XML Signature MUST NOT use whitespaces inside the character content. This ensures that each party can compute a consistent digest value. 1. Create an XML Signature ds:SignedInfo block. Because canonicalization includes the namespace prefix, this MUST use an XML namespace prefix of "ds" so each party can compute a consistent digest value. 2. Populate the block with the appropriate canonicalization and algorithm blocks based on the scheme in d:Security/d:Sig/@Scheme. · First add a ds:CanonicalizationMethod element with Algorithm attribute set to http://www.w3.org/2001/10/xml-exc-c14n#. · Next add a ds:SignatureMethod element with Algorithm attribute value set to http://www.w3.org/2000/09/xmldsig#rsa-sha1. 3. For each ID in d:Security/d:Sig/@Refs create a corresponding XML Signature Reference element to the identified part (using URI fragments) annotated with the canonicalization and digest algorithms from the scheme in d:Security/d:Sig/@Scheme. Note that individual digests need to be computed on the fly. · Add a ds:Reference element. · The @URI attribute's value is a "#" followed by the specified ID. · Inside the ds:Reference element add a ds:Transforms element that contains a ds:Transform element indicating the selected canonicalization algorithm. · If d:Security/d:Sig/@PrefixList is present, create an ec:InclusiveNamespaces element inside ds:Transform element. Because canonicalization includes the namespace prefix, this MUST use an XML namespace prefix of “ec” so each party can compute a consistent digest value. Add PrefixList attribute to ec:InclusiveNamespaces element with value equal to that of d:Security/d:Sig/@PrefixList. · Inside the ds:Reference element add a ds:DigestMethod element with Algorithm attribute set to http://www.w3.org/2000/09/xmldsig#sha1. · Inside the ds:Reference element add a ds:DigestValue element with the computed digest value of the part represented by this ds:Reference element. 5. Create a wsse:SecurityTokenReference element. 6. Within this, add a wsse:KeyIdentifier element with the value of the KeyId attribute's value. Table 14 lists the expanded signature obtained by applying above steps to the corresponding compact form in Table 13. Table 14: Example expanded signature corresponding to the compact form in Table 13. Once expanded, compute the final signature, and verify that it matches. Message discovery, both announcements and searches, are subject to a wide variety of attacks. Therefore communication SHOULD be secured using the mechanisms described in Section 8.2 Compact Signature Format. · Message alteration – An attacker can change message content. To prevent this, the message SHOULD be signed. The Body and all relevant headers SHOULD be included in the signature. Specifically, the Application Sequencing header, WS-Addressing [WS-Addressing] headers and any headers identified in Endpoint References SHOULD be signed together with the Body to "bind" them together. · Availability (Denial of Service) – An attacker can send messages that consume resources. To prevent this, a signature assures that a message is of genuine origin. To avoid unnecessary processing, the signature SHOULD be validated before performing beginning any significant processing of message content. · Replay – An attacker can resend a valid message and cause duplicate processing. To prevent this, a replayed message is detected by a duplicate [message id] property [WS-Addressing] or an older Application Sequencing header and SHOULD be discarded. Implementations MAY also use the Timestamps mechanism defined in [WS-Security] to protect against the replay attack. In that case the wsu:Timestamp element [WS-Security] SHOULD be included in the d:Security header and SHOULD be signed. · Spoofing – An attacker sends a message that pretends to be of genuine origin. To prevent this, the signature SHOULD be unique to the sender. To provide mitigation against other possible attacks, e.g., message disclosure, mechanisms defined in WS-Security [WS-Security], WS-SecureConversation [WS-SecureConversation], and/or WS-Trust [WS-Trust] MAY be applied. If a Client communicates with a Discovery Proxy, the Client SHOULD establish end-to-end security with the Discovery Proxy; to improve the efficiency of security operations, the Client SHOULD establish a security context using the mechanisms described in WS-Trust [WS-Trust] and WS-SecureConversation [WS-SecureConversation]. In such cases, separate derived keys SHOULD be used to secure each message. To be conformant with this specification an endpoint MUST implement at least one of the roles; Target Service, Discovery Proxy, and Client; and MAY implement it in more than one of the modes; ad hoc and managed; however, for each implemented role and mode, it MUST implement them as specified herein. An implementation is not conformant with this specification if it fails to satisfy one or more of the MUST or REQUIRED level requirements defined herein for the roles and modes it implements. Normative text within this specification takes precedence over normative outlines, which in turn take precedence over the XML Schema [XML Schema Part 1, Part 2] and WSDL [WSDL 1.1] descriptions, which in turn take precedence over examples. Shin Ohtake, Fuji Xerox Co., Ltd.
Alain Regnier, Ricoh Company, Ltd.
Hitoshi Sekine, Ricoh Company, Ltd.
Hiroshi Tamura, Ricoh Company, Ltd.
David Whitehead, Lexmark International Inc.
Don Wright, Lexmark International Inc.
Prasad Yendluri, Software AG, Inc. This document is based on initial contributions to the OASIS WS-DD Technical Committee by the following co-developers. The following individuals have provided invaluable input to the original contributions and were acknowledged in the initial contributions. Created the initial working draft by converting the input specification to OASIS template. Adjusted the location of the document as per the format decided on 09/18/2008 during F2F meeting day 3. Fixed broken links for cross referencing Table, Figure and Section. Created first committee draft by from working draft 03. Removed all change bars. Applied the resolution of following issues to the document. 086 - Example Hello sent in managed mode does not define "i"
096 - Clarify meaning of "device leaving the network"
097 - Clarify meaning of "device joining the network"
106 - redundant mentions of "one way"
108 - clarify "stable identifier"
Created CD-02 candidate draft from working draft 05 by accepting all changes and removing all comments. Applied the resolution of following issues. Following editorial changes were made to be compliant with the OASIS document format. * Cover Page: Previous Version was marked as N/A. * Section 2.1 Terminology is moved under Section 1.5 Terminology and named as 1.5.2 Terms and Definitions. Added a line "Defined below are the basic definitions for the terms used in this specifications." before starting the definitions. * The format of the definitions in section 1.5.2 is changed to have space in-between two definitions. * Section 2.5 Compliance became Section 9 Conformance. Additional editorial changes to comply with the OASIS document format. * Corrected errors in hyperlinks in the first page of the document. * Removed "Latest Approved Version" links as suggested by OASIS TC admin. * Appendix. Acknowledgements. In the list of TC participants, removed mention of company name of Individual or Associate members per advice from OASIS TC admin. * Added the Revision History appendix section. Changed the cover page to reflect CD 02 status. Created public review 01 document from CD 02. Includes resolution of following editorial issues. Includes the resolution of the editorial issue PR-005. Included the resolution of the editorial clarification issue PR-008- WS-Discovery - Clarifications to ad hoc and managed mode definitions. Added names of 3 new TC members to acknowledgment section. Created Committee Draft 03 document from WD-08. Created Committee Draft 04 document from CD-03 version of the document (no changes). This is to be consistent with the version number of the schema and WSDL files. Created Committee Specification 01 document from CD-04 version of the document.